Let’s start by being upfront and saying that new Kennedy Town restaurant Chino isn’t officially affiliated with much-loved Sheung Wan izakaya-style yakitori haven Yardbird. But we mention the connection because Chino chef Eric Idos has been knocking up some delights at Yardbird’s curated convenience store, Sunday’s Grocery, of late and he’s definitely been sharing ideas with the ‘bird team because the vibe, the service and, to a certain extent, the ethos behind the food at Chino is strangely familiar. The style of the new restaurant is, like Yardbird, trendy-casual, with floor-to-ceiling glass windows and a wall of street artist Aaron de la Cruz’s minimalist etchings at the back. And, also like Yardbird, the menu goes for something out of the ordinary. 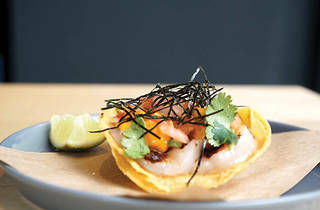 Here, there’s a novel combination of Mexican-style fare inspired by Japanese ingredients and techniques. You’re even given chopsticks, despite the dishes being South American. We don’t use them as we start off with the roasted corn ($78), that’s dashed with tangy mayo and crumbly cojita cheese, which whets our appetite for the substantial items to come. On to the tacos and tostadas, then. We sink our teeth into the lightly battered crispy fish taco ($58). The battered fish is crunchy and it’s all deliciously undercut by chipotle-mixed kewpie mayo. However, even this fades in comparison to the scallop and uni tostada ($88). 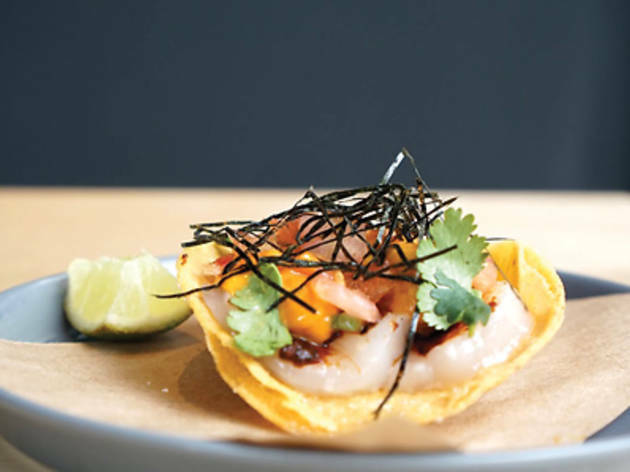 Sweet uni and raw scallop sit neatly on top of a crispy toasted tortilla, which is seasoned with red miso and garnished with salsa and nori. This dish embodies what Chino is about – the appreciation of fresh Japanese ingredients served in the Mexican casual street-style way. We round things off with a saucy dish simply called ‘clams’ ($148), that’s soaked in a mild pepper and shallot broth. The clams are superb and the peppery sauce brings out their flavours. You’d be surprised how these tasty small dishes can fill you up at this eatery. Idos and his team have clearly been influenced by the ultra-successful yakitori restaurant up the road in Sheung Wan with the service and style. But Chino actually goes further, serving up a creative and cohesive marriage of two seemingly unrelated cultures. The concept is novel and it works. Like Yardbird, we could be looking at another landmark culinary institution in Hong Kong.